Gordon Overstreet caught the “sports bug” while playing American Legion and Ben Johnson League baseball during high school in Missouri. Later, at Northwest Missouri State College, he lettered for three years in baseball and track. This experience came in handy when Gordon coached baseball during a tour with the U.S. Navy and later as football, baseball and basketball coach in Iowa and at Wakefield Junior High School in Tucson. His true calling, however, has been that of an official. He has officiated both basketball and football in NCAA Division I and II, Border Conference and WAC. He has been Observer of Officials for both men and women in the Pac-10, NCAA Division I quarter-finals, Division II Regionals, the Junior College Arizona Conference, Astro Bluebonnet Bowl and Fiesta Bowl, as well as the Arizona Interscholastic Association. 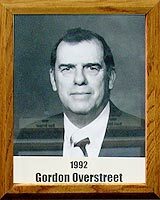 Overstreet, who did graduate work at the University of Arizona, also has been active with Youth League Football, Delta League Football and Basketball and the Y’s Club of the YMCA. Among others, he has received certificates of recognition from Class AAA Conference and Arizona Interscholastic Association and is a holder of the Distinguished Service Award from the National Federation of State High School Coaches Association.